When it comes to studying the Bible, not only are there many choices of translations, but also many choices of study Bibles. Here is an overview of some that I have found helpful. There are several general study Bibles that are connected directly to a certain translation of the Bible. If a person cannot afford an entire set of commentaries, or wishes to have commentary on the whole Bible in one volume, these study Bibles are the best option. The NASB Study Bible (also available with the same notes as the NIV Study Bible), the HCSB Study Bible, the ESV Study Bible and the Jeremiah Study Bible (NKJV) are examples of this. Each of these study Bibles have extensive introductions to the books of the Bible, maps, and notes at the bottom of the page to explain the text in the particular translation used. The ESV Study Bible is the most scholarly and exhaustive of these study Bibles. The HCSB Study Bible is in a more popular style, and makes the best use of color, making it the easiest to read. The Jeremiah Study Bible has notes by popular Bible teacher, Dr. David Jeremiah. Some study Bibles focus on a special purpose. The Archaeological Study Bible (NIV) includes notes and articles that explain the cultural and historical background of the Bible. The Life Essentials Study Bible (HCSB) and Life Application Bible (available in NLT, NIV, NKJV, NASB) focus on applying the truths of scripture to our lifestyle. The Life Essentials Study Bible makes use of QR code. Readers can scan the code with their mobile phone and watch a video of a Bible teacher explaining the passage in greater depth. The Discover God Study Bible (NLT) focuses on devotional and doctrinal truth. This is an excellent study Bible for a new believer. The Apologetics Study Bible (HCSB) includes notes and articles that defend the Christian faith against non-Christian religions and skeptics. 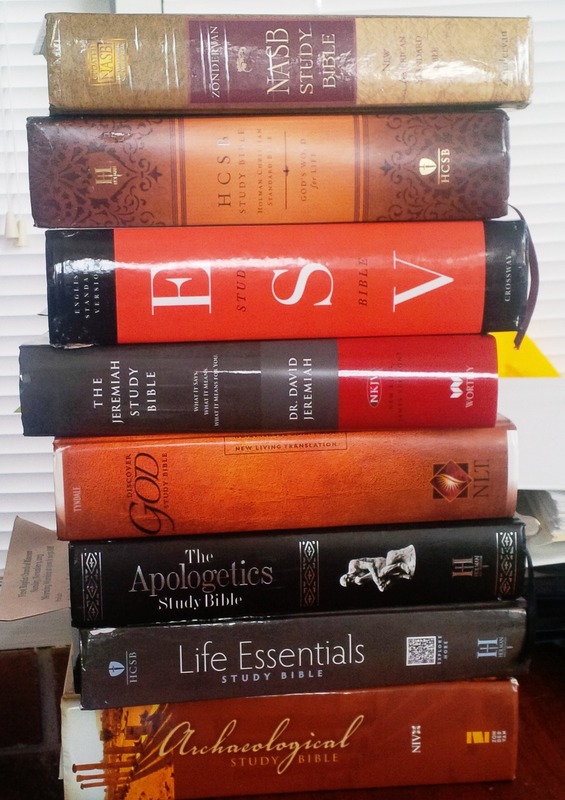 All of these study Bibles are excellent resources in shedding light on God’s word. I refer to many of them on a regular basis, depending on how I am studying a particular passage. But none of these aids can substitute for simply reading the text first yourself. I would recommend you read and read again the text and make your own notes on what you observe before you turn to these or any other study aids. After your own study, check your observations with those of the experts. That way, you will allow the Holy Spirit to speak directly to you through scripture, and to speak to you through those who have studied it before you. English-speaking readers of the Bible have so many different versions to choose from, that it can be hard to know which one to use. As a pastor who has studied nearly every translation over the 34 years of my ministry, many people ask me which translation they should use. Thus I have written this article to give you some guidance. Please note that I am referring to translations and paraphrases. I am not referring to various kinds of study Bibles and specialty Bibles. For example, you can get the Scofield Reference Bible or the Life Application Bible, etc. in multiple different translations. And there are children’s and youth Bibles, military Bibles, athlete Bibles, etc. with different covers and notes and devotional comments. None of that is discussed here. I am strictly talking about the text of the Bible itself. The Old Testament was written in Hebrew (and some Aramaic), and the New Testament was written in Greek. The biggest issue for translations is: How literally should we translate it into English? If a translation follows the exact word order and literal idioms of the original language, the result may be technically accurate, but it may be difficult to understand. On the other hand, if a translation or paraphrase strives to put it in modern English, the result may be easy to read, but inaccurate and lacking the precise teaching of God’s Word. As they balance between these two extremes, Bible versions tend to fall into four different categories: literal, dynamic, free and paraphrased. Literal translations strive as much as possible to follow the original text word for word. This is not entirely possible, because certain words require more than one word in English to translate, and sometimes English words need to be added that are not in the original language for the sentence to make sense in our language. Also, word order can have different meanings in different languages. So no translation is completely literal, but the ones that I list as “literal” try their best to faithfully follow the original, sometimes at the sacrifice of being clear to modern readers. Here are the best-know literal translations: King James Version (KJV), New King James Version (NKJV), Revised Standard Version (RSV), New Revised Standard Version (NRSV), New American Standard Bible (NASB), English Standard Version (ESV), Douay Rheims (DR), and the New American Bible (NAB). The King James Version was first translated in 1611, and the current edition of the KJV was updated in 1769. While the KJV is a literary masterpiece, its archaic language can be difficult to read and can be misunderstood by modern readers. Nevertheless, its familiar words are still preferred by millions of Christians who were brought up with the KJV. The New King James Version preserved most of the traditional wording of the KJV, while making it more readable and more accurate. However, because the NKJV follows the same manuscripts as the KJV as much as possible, it unfortunately does not use some of the more accurate manuscripts available today to translators. The Revised Standard Version is an accurate, literal translation, but it tends toward a more liberal viewpoint on certain translation issues. This approach is preferred by its sponsors, the National Council of Churches. The New Revised Standard Version updated the RSV and made it gender-neutral when referring to people, much as the NIV did recently (see below). Thus the NRSV is the preferred translation today in liturgical and liberal Protestant churches. The New American Standard Bible and English Standard Version are the most accurate literal translations and the most popular among evangelical, conservative Bible scholars. The NASB, a revision of the American Standard Version of 1901, is considered the most accurate for serious study, and the ESV is considered the most literary and readable among literal translations. The ESV tends to be popular among Reformed churches. Douay Rheims is the traditional Roman Catholic translation published in 1582 and 1610, heavily dependent on the old Catholic Latin Vulgate. It includes the Apocrypha, additional Old Testament books used by Catholics. In recent years, this translation was revised and published for Roman Catholics as the New American Bible, and in 2011 the New American Bible Revised Edition was published. This translation uses gender-neutral language. Dynamic translations also seek to follow the original text as accurately as possible, but they are more willing to revise word order and phrases and use more contemporary words to translate the original more clearly. The best-known dynamic translations are: New International Version (NIV), Amplified Bible (AB), Christian Standard Bible (CSB), Holman Christian Standard Bible (HCSB), Jerusalem Bible (JB), the New Jerusalem Bible (NJB) and God’s Word Translation (GWT). The Amplified Bible is a unique translation that consistently lists alternate translations in parentheses, making it a useful study Bible. However, this feature makes it an awkward Bible for reading. The Christian Standard Bible (CSB), published in 2017, is a major revision of the Holman Christian Standard Bible. It is one of the most accurate of the dynamic translations. It eliminated some of the unique and quirky characteristics of the older HCSB, following more traditional renderings of the text. It is more accurate than the NIV, and while having some gender-neutral translations such as “brothers and sisters” for the “brothers” Paul addresses in his letters, it does not go as far with gender-neutral translation as the NIV, continuing to refer to “fathers” rather than “parents.” The CSB was translated by conservative scholars and its copyright is owned by LifeWay Christian Resources of the Southern Baptist Convention. The Jerusalem Bible is a dynamic and literary translation for Roman Catholics that includes the Apocrypha. It was based on a French translation. The Jerusalem Bible was later revised as the New Jerusalem Bible, which includes gender-neutral language. God’s Word Translation is perhaps the most readable among the dynamic translations. It uses gender-neutral language, and tends to use shorter sentences and words like “kindness” instead of theological words like “grace.” It was hard to decide whether to list GWT as a dynamic or a free translation, but since it tries to follow more closely the original text than other free translations, I will list it here. Free translations seek to translate thought for thought more than word for word. Free translations use very contemporary language, shorter sentences, and they freely add phrases that are not in the text in order to communicate the idea to our culture and language. These translations are very easy to read, but are less accurate for serious study. All of these translations use gender-neutral language to some degree. Some of the best-known free translations are: New Living Translation (NLT), Good News Bible (GNB), New Century Version (NCV), Common English Bible (CEB), Contemporary English Version (CEV) and New International Reader’s Version (NIrV). Some of free translations target a child’s reading level by using very short sentences, especially the CEV and NIrV. The Common English Bible tends to follow a more liberal viewpoint in translation, and is thus more popular among liberal Protestant churches. Among free translations, the New Living Translation is one of the more accurate, and has become the most popular. Paraphrases radically alter the original text, putting the emphasis on communicating the thoughts and ideas in very contemporary language. Two of the best-known paraphrases are: The Living Bible (TLB) and The Message (TM). The Living Bible, paraphrased by Ken Taylor, sold millions of copies a generation ago, and at one time was nearly as popular as the KJV, yet it was strongly opposed by those who preferred literal translations. The publishers of the Living Bible responded to this criticism with the New Living Translation. The Message is a vivid, newer paraphrase written by Presbyterian pastor and Bible scholar Eugene H. Peterson. It tends to capture the emotion of scripture. The Message is more literary and sophisticated than the Living Bible. The Message has been very popular in the past decade. The Voice Bible was first published in 2012. The Voice is a translation that is amplified with paraphrase. That is, the text has a fairly accurate translation, but then it inserts additional words into the text in italics for clarity and explanation. It emphasizes the hearing the word (thus the name The Voice), and is written in a literary style. It is displayed in screenplay format, to highlight spoken words. Paraphrases can be useful in getting new insights into scripture, but they should not be used for serious Bible study. Even Eugene Peterson himself says that his paraphrase is intended to make Bible reading fresh, but it is not intended to be read in church or Bible studies as if it was the Word of God. There are other paraphrases that are interesting novelties, such as the Cotton Patch Version written by Clarence Jordan, which sets the events of the New Testament in Georgia; the Clear Word Bible written by Seventh-day Adventist Jack Blanco for devotionals; and The Word on the Street written in urban lingo by Rob Lacey. CAUTION: There is one other widely distributed “translation” that I should mention. The New World Translation is distributed by the Watchtower Bible and Tract Society, which is the publishing arm of Jehovah’s Witnesses. Beware of this perversion of the Bible that twists scripture to deny the divinity of Jesus Christ. So we have come full circle back to the original question of this article: What Bible translation should I use? The answer: compare several of them! For serious study, it is wise to refer to a literal translation. I myself prefer the New American Standard Bible (NASB) and English Standard Version (ESV) for this purpose. For daily Bible reading, a dynamic or free translation may be useful to get a clear understanding of the meaning. For daily reading, I prefer the Christian Standard Bible (CSB) and New Living Translation (NLT), and I still like to read my old Holman Christian Standard (HCSB) and refer to my old 1984 edition of the New International Version (NIV84), which are both no longer in print. Occasionally, I also like to read The Message to get a feel for the passion of scripture, especially the Psalms. And I still quote familiar passages like Psalm 23 from the King James Version. My prayer for you, as you read this guide, is not that you will choose a translation that makes you feel good, but that you will choose a translation that best helps you understand and obey God’s Word. To God be the glory! If you see a video ad below this past, please understand that I have no control over these ads, and that I do not necessarily endorse the product. If you see an ad that is inappropriate, feel free to contact me, Bob Rogers, at bobrogersthd@gmail.com.